Global 3D printing medical devices market expected to generate revenue of around USD 2.34 billion by the end of 2024, growing at a CAGR of around 18% between 2018 and 2024. 3D printings have huge potential in medical devices and other products, including food, household items, and automotive parts due to its capabilities. The report covers forecast and analysis for the 3D printing medical devices market on a global and regional level. The study provides historical data from 2015 to 2017 along with a forecast from 2018 to 2024 based on revenue (USD Billion). 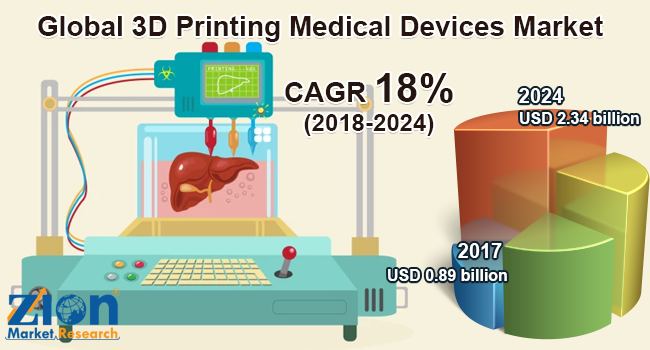 The study includes drivers and restraints for the 3D printing medical devices market along with the impact they have on the demand over the forecast period. Additionally, the report includes the study of opportunities available in the 3D printing medical devices on a global level. In order to give the users of this report a comprehensive view on the 3D printing medical devices market, we have included competitive landscape and analysis of Porter’s Five Forces model for the market. The study encompasses a market attractiveness analysis, wherein component, technology, application, technology, and regional segmentation are benchmarked based on their market size, growth rate, and general attractiveness. The study provides a decisive view on the 3D printing medical devices by segmenting the market based on component, technology, application, technology, and regions. All the segments have been analyzed based on present and future trends and the market is estimated from 2018 to 2024. Based on components, 3D printing medical devices market has been segmented into system, materials, and software & services. Technology segment is divided into 3D printing, droplet deposition, photopolymerization, laser beam melting, electron beam melting (EBM), laminated object manufacturing (LOM), and others (ColorJet printing, MultiJet printing). Based on application, 3D printing in the medical devices market have been segmented into external wearable devices, clinical study devices, implants, tissue engineering. Based on technology, 3D printing medical devices market have been segmented into medical and surgical centers, pharma and biotech companies, and academic institutions. Growing technological advancements in 3D printing, increasing public-private funding, easy development of customized medical products, and growing applications of 3D printing in the healthcare industry are some of the factors that are driving the market growth during the forecast period. Additionally, 3D printing medical devices impart significant cost savings which majorly account to the growth of the market. The regional segmentation includes the current and forecast demand for North America, Europe, Asia Pacific, Latin America, and the Middle East & Africa with its further bifurcation into major countries including the U.S., Canada, Mexico, Germany, Spain, Italy, France, UK, China, Japan, India, and Brazil. This segmentation includes demand for 3D printing medical devices based on individual segment and applications in all the regions and countries. The report also includes detailed profiles of end players such as 3D Systems Corporation, EnvisionTec, Stratasys Ltd, Arcam AB, Organovo Holdings, Inc., Bio3D Technologies, Oxford Performance Materials Inc., Materialise NV, Cyfuse Biomedical K.K., SLM Solutions Group AG among others.